British High Commissioner to Cameroon Brian Olley organised a reception at his Residence to bid farewell to 18 Chevening scholars. The scholars will pursue a master’s degree in a course of their choice in some of the best universities in the UK during the 2017-2018 academic year. This year’s cohort of scholars comprised eight women and ten men. In a first, one of the scholars is a person with special needs (visually impaired); he will pursue an MA in International Public Relations and Global Communication Management at Cardiff University. Two others hail from non-resident countries (Chad and Gabon) managed by the British High Commission in Yaounde. I am indeed delighted to bid farewell to this special batch of scholars from Cameroon, Chad and Gabon a few months before the end of my mission to Cameroon. The British Government is inclusive and diversity friendly. We value difference, promote equality and challenge discrimination, enhancing our organisational capability. Remember, you owe responsibility to your various communities upon your return next year. Therefore, show the way as future leaders by studying hard and by taking all the positive things the UK has to offer you. 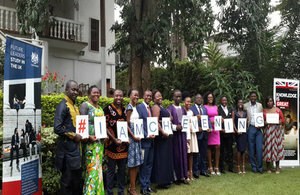 On his part, Cameroon’s Minister of Higher Education Professor Jacques Fame Ndongo, described Chevening scholarships as a powerful education tool for Cameroon’s future leaders and acknowledged the work of the outstanding Cameroon Chevening alumni.